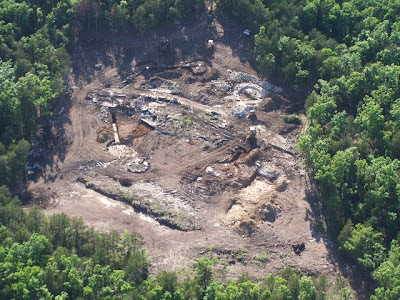 Ground has been broken to build a medieval castle in the United States of America. Stone by stone it is being built. Each stone is cut by workers using hammers and chisels, then the stones are hewn by hand to the exact shape wanted by masons. The masons carefully lay the stones down with mortar hand mixed on the site. The castle walls will be six feet thick and will stand forty-five feet high. The fortress will also have a drawbridge and a moat. This building project will be done year round and it is projected that the fortress will be completed in twenty years. 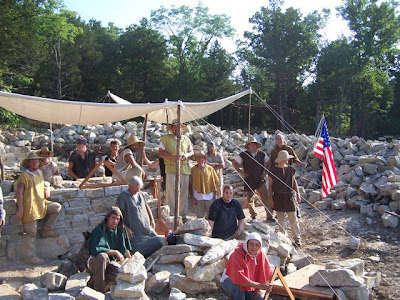 It is the Ozark Medieval Fortress being built in Arkansas, not far from Branson, Missouri. Construction started in June 2009 and will be open for visitors in May 2010. Visitors will be able to see an active construction site and ask questions of the craftsmen. It is a wonderful opportunity to see how things were done before the advent of power tools. I learned of this project via an email the other day. The creative forces behind the Ozark Medieval Fortress are the same ones who created Guédelon in France. They discovered the blog post I had written about Guédelon and sent me an email telling me about their new project in Arkansas. I had the wonderful experience of speaking with Michel Guyot's wife Noémi Brunet by phone the other day about Guédelon and the Ozark Medieval Fortress projects. Noémi gave me permission to use these photographs to help illustrate my post. 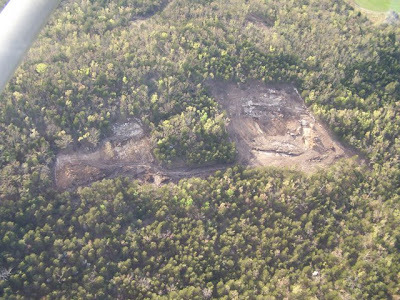 On the left is the quarry, on the right is where the fortress will be built. According to their website they are hiring right now. They are in need of master stonemasons but this kind of project will need carpenters, blacksmiths, tile makers, rope makers, basket weavers and more. It is a veritable community of craftspeople whose skills are needed in the construction of castles. The first of many workshops to be built. They are also looking for people who would like to volunteer. 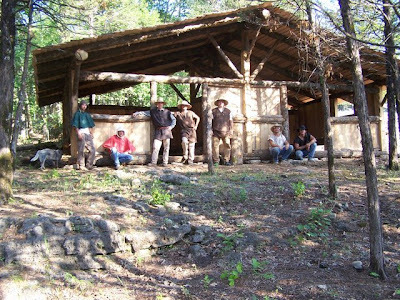 At Guédelon they have many volunteers who spend a portion of their holiday time helping in the construction. Some work as blacksmiths, while others cut down trees for scaffolding. They have some volunteers who enjoy the work so much that they come back year after year during their breaks from their regular jobs to spend time at Guédelon. We used to have good old fashioned barn-raisings where a community would come together and help build a barn. Well if the idea of helping to build a castle intrigues you, even if it is only for a week or so, they would like your help. You would not have to permanently move to Arkansas or change your career, but you can go and volunteer when you have some spare time. 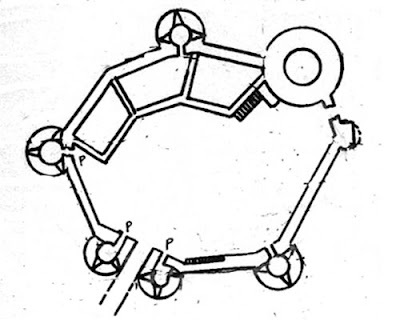 Architectural drawing of the plans for the fortress. A maquette of the future fortress. Noémi was very interested in reaching out to the Medievalist communities in the United States and to tap into a potential volunteer pool. I am going to do my part to contact those who I think will share an interest in this living history project. For more information about the project or how you can volunteer you can contact them via their website. Another aerial view, this time showing the broad outlines of the future fortress. I will be posting more on this subject in the future. I am certain of that. In the meantime, please spread the word. Edited to add: here is a link to my first update on this project which includes architectural drawings of what the finished fortress should look like in three different phases. Fascinating! That's quite a project to undertake. Glad you'll be keeping us up to date on things. Guedelon is so cool and it is wonderful to see a similar project in our country. This is going to be huge once the word gets out. I feel honored that their creators contacted me about this wonderful project. As my husband and I were walking around Guedelon, we kept thinking how it would be wonderful if there was something like that in the States. It is going to be very popular. And it will likely be helpful to historians as well who have had nagging questions about construction of buildings but never knew the answer. This is truly reverse-engineering at work to put our current theories about the past to the test. That's quite a project, but I'm sure that Guyot will pull it off. Guédelon is very impressive and I'm sure that the Ozark Fortress will be too. We are planning a family trip up that way in a few weeks. Thanks for the great picture and information!